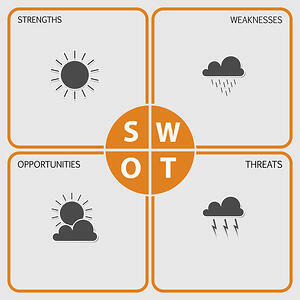 A SWOT analysis is a business tool that identifies an organization's strengths, weaknesses, opportunities, and threats. You can also use this tool for communication, marketing, and public relations strategies as it helps identify which areas to focus on and helps improve communication methods. Once you download Axia Public Relations’ complimentary SWOT analysis template, we recommend you and your internal team complete the template and ask external contacts (such as community members, business partners, current customers, prospective customers, and past customers) to help you complete it. You can do this through a focus group or online survey. This way the SWOT analysis will have an external and internal view of your organization versus only what you perceive internally. Employees may be unaware of what outsiders perceive. It’s critical to ask external audiences for feedback on your organization’s SWOT since your overall PR plan likely focuses on communicating with external audiences. On average, medium companies invest $250,000 and more per year on outside public relations firms as well as spending time and money to make sure the research and measurement processes are correct. If you’d like additional data on what other companies are spending on PR, download Axia Public Relations’ intelligence report today. Clients love Katie’s energy and enthusiasm. 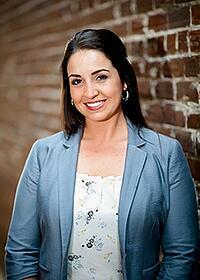 She works with local, regional, and national clients coordinating their PR campaigns. Katie has worked with Axia Public Relations since September 2015. Learn more about Katie.